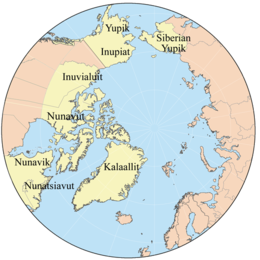 The Eskimo are the indigenous fowks wha hae tradeetionally inhaibitit the northren circumpolar region frae eastren Siberie (Roushie), athort Alaska (Unitit States), Canadae, an Greenland. ↑ "Eskimo." The Free Dictionary Retrieved 27 Jan 2014. This page wis last eeditit on 3 Apryle 2017, at 18:16.